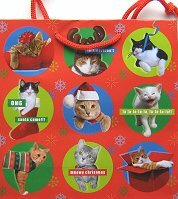 The four kittens on this Christmas gift bag have an "attitude". They are saying: feliznavidon't, OMG sanata came! !, fa-la-la-la-la-la!! and meowy christmas. The gift bag is 8" high x 8" wide x 3" deep. Corded handle.